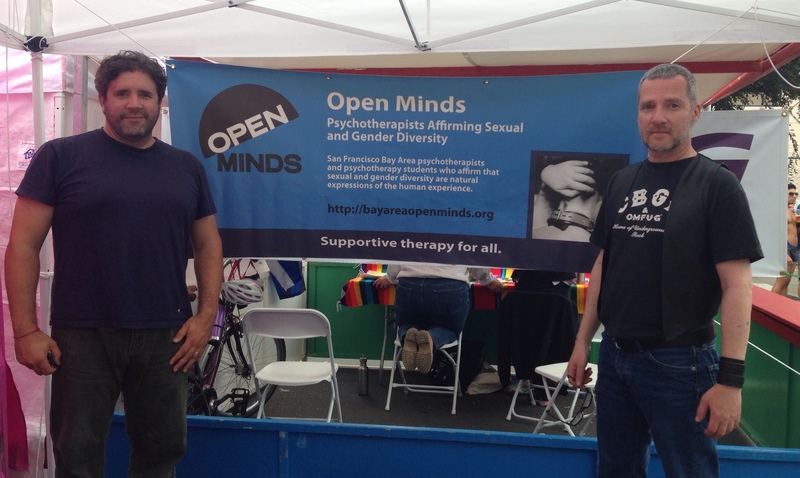 Bay Area Open Minds had our second showing at the 2014 Folsom Street Fair this year. Thank you to member Christopher Corey, MA who made it all happen and organized all of our efforts. Second, thanks to everyone who assisted and who sat in our booth and talked to passersby and gave them our brochures. Lots of folks took brochures and were excited to know we are here. Thank you to: Daniel Clifford, MA, Jaclyn Lambe, PsyD, Joe Zarate-Sanderlin, MFC, Josie Valderrama, PsyD, and Karen Davison, PsyD who shared a shift with me, Dr. Keely Kolmes. We intend to have a yearly presence at Folsom. It is such a joy to celebrate with our community and see how well-received our organization is. Here is a picture of Daniel and Chris at our booth.